Used 2014 Mercedes-Benz C-Class C300 4MATIC Luxury Sedan for Sale in Indiana PA 15701 AutoSport Co. Offered for sale is a Clean Carfax, well maintained 2014 Mercedes-Benz C300 4MATIC Luxury Edition with only 61k miles!! 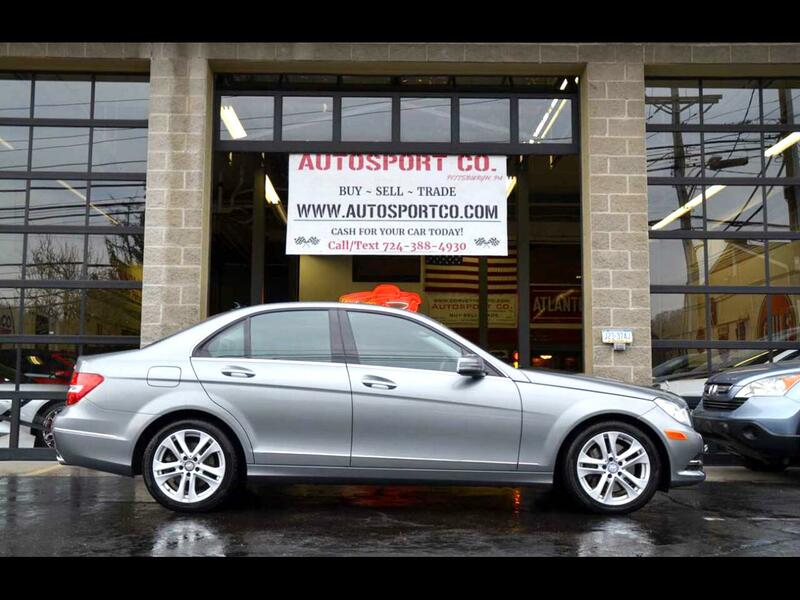 This All Wheel Drive Mercedes C300 is loaded up with features to enjoy and is a great choice for a year round vehicle. The Gray exterior of this Mercedes shows excellent with very minimal wear present for its age likewise, the upgraded factory wheels show excellent, have a lot of tread left to enjoy on the tires and give this car a great look to it that is sure to please. Throughout the smoke free, black leather interior there is no abnormal wear present, all the carpeting, dash area and console all show excellent. In addition this 2014 Mercedes-Benz C300 4MATIC with only 61k miles is equipped with options such as: Clean Carfax, 3.5L 6-Cylinder, All Wheel Drive, Heated Leather Seats, Factory Sunroof, Factory Backup Camera, Premium Wheels, Factory Navigation, Harman Kardon Stereo System, AM/FM/CD/AUX/Bluetooth Player, Steering Wheel Controls, Luxury Package, Multi-Zone Air Conditioning, Current PA Inspections, 2 Sets of Keys, Original Owners Manuals and much more!! We were told while the Carfax says it is a 3 owner, it was actually a 2 owner Mercedes maintained at the Mercedes dealership. The original owner leased the car originally and then decided to purchase the car when their lease was up before selling it to the next owner. This car is located at our Pittsburgh location, we accept trades and can help with financing options. Feel free to call or text Anthony at 724-388-4930 with any questions, we look forward to speaking to you. Thank you!